I made those chocolaty sweet potato muffins for the first time already in the beginning of January. Everything was perfect about them – the consistency, taste, sweetness and moistness. Don’t miss the tutorial video further down! However, I must have written down the wrong liquid quantity because I just couldn’t repeat the recipe with the same perfection – they were yummy and all, but every time just too moist. I ate them with wooden spoon straight from muffin mold 🙂 So tasty, but not the same recipe – you know what I mean! So, I experimented and experimented until I got it right again. 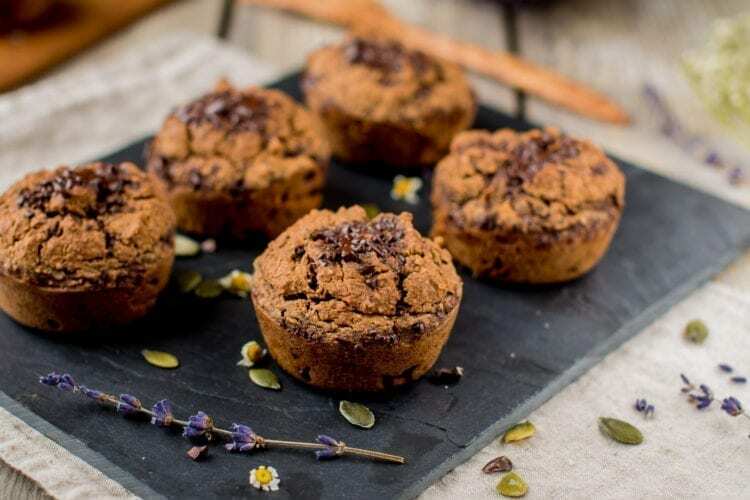 My first version of this chocolaty sweet potato muffin recipe used buckwheat and oat bran whereas in the current recipe I ditched the latter and here’s why! 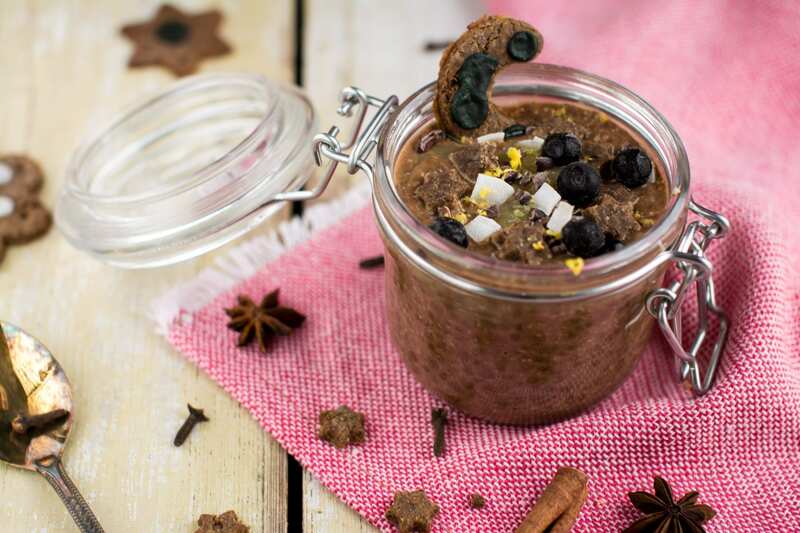 I discovered oat bran in August last year when I started my vegan Candida diet – I was so happy because they were super yummy and had much lower glycemic load than other grains. I didn’t even think that it’s actually not whole food, but only part of oats, mainly fibre. 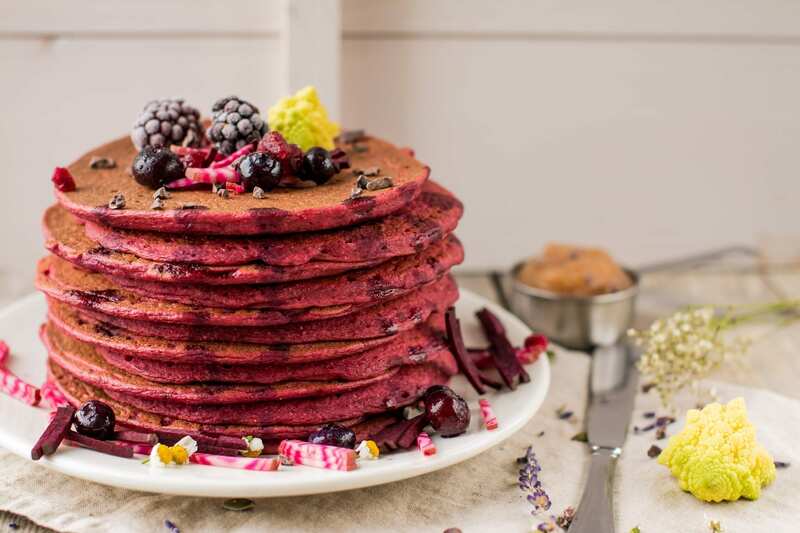 So, I started to use them everywhere – porridges, pancakes, muffins, cookies, cakes, chia puddings, and all this because I wanted to bring the glycemic load of these delicious bites down so that I wouldn’t have blood sugar fluctuations. I never thought there would be downside to oat bran, but obviously there is! As the intake of oat bran went up, I started to experience digestive ailments that I didn’t know to ascribe to high fibre intake in the beginning, but last week it finally hit me and I immediately compared my current fibre numbers with August and saw a rise of 30%. I keep detailed food diary, if you wonder how I can be so precise. Now, eating a whole food plant-based diet already means that you get quite a lot of fibre. Imagine adding almost pure fibre to this diet! Of course the number skyrockets! I can’t tell you what the optimal fibre intake would be as this is highly individual, but for me it is around 65 grams not to experience any digestive issues. And you must remember that drinking enough pure water is very important when eating a high-fibre diet or you’ll get constipated. If you drink enough water and experience bloating and/or mild diarrhoea, then it might be the sign of too much fibre. 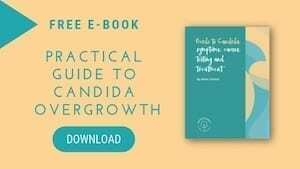 I just knew that something was up with my digestion, so I made the deduction, immediately diminished my fibre intake and within a day felt super! 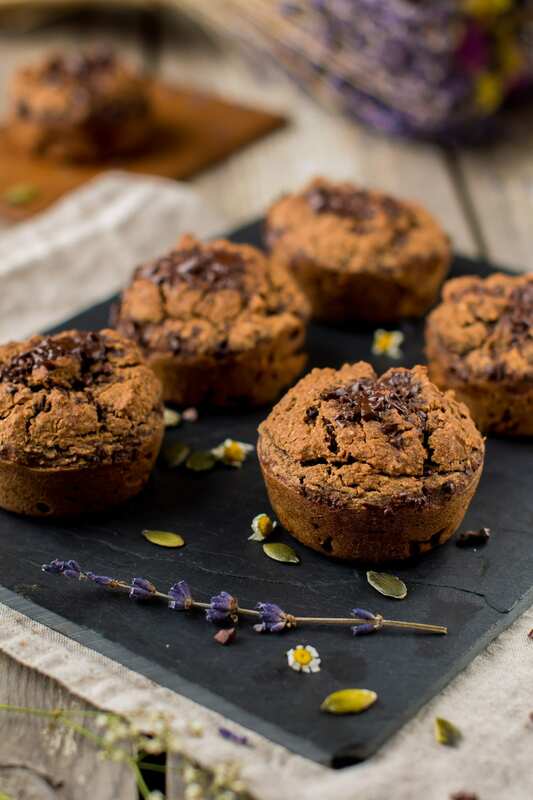 If you are not eating enough fibre and are trying yo increase its intake, then read Ashley’s post Gluten Free Vegan Chocolate Muffins where she has a long and thorough fibre talk. Now, back to the chocolaty sweet potato muffins! 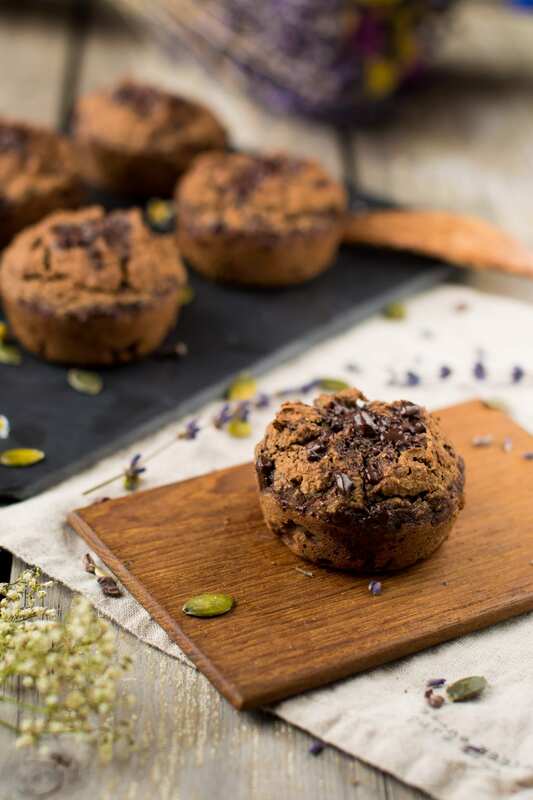 Again, I can say that those are one of my favourite muffins as the finely grated sweet potato gives them this perfect moistness and sweetness + the subtle taste of cacao makes them just perfect! My Chocolaty Sweet Potato Muffins are vegan, plant-based, oil-free, low fat, gluten-free and Candida diet friendly. Soak buckwheat groats overnight or at least 6 hours, then rinse and drain. They will absorb 50 grams water. Finely grate and measure sweet potato. Put all ingredients, except raw grated sweet potato, into blender and blend into smooth batter. Finally mix in the grated sweet potato. Divide the batter between 6 muffin forms. Bake in the middle rack for 37 minutes. Remove from oven, drizzle with some chopped dark chocolate (optional) and let cool. These muffins are not overly sweet, so should you need more sweetness, add more stevia, xylitol or juicy dates (if you are not on Candida diet). It’s important that you use oven-baked sweet potato! Steamed or boiled ones are much more moist, so you’d need to use less or add more ground oats. Hi, I am looking forward to making these yummy bundles of sweet potatoes, but do I measure 60g of buckwheat before soaking or after, and the same question goes to the sweet potatoes – 100g of already baked potatoes or do I measure them before baking. Measure buckwheat before soaking and 100g of already baked sweet potato. Enjoy the muffins! We did enjoy them, they turned out incredibly moist and delicious. I baked them in the normal tray since I don’t have a muffin tin, but it worked great nevertheless. Oh man. I may need to make these muffins next!! Do you have nay tips on how to oven bake sweet potatoes for the best results? I actually hate when they turn out too moist (and then they also get too sweet for me as well), but I can’t seem to figure how to bake them so they are drier/fluffier. It’s so frustrating. Yours look like they are perfect, though, so you must harbor the sweet potato baking secret too! Any guidance you can offer would be much appreciated. Oh yes, those sweet potato muffins — I had forgotten about them 🙂 When the autumn comes they’ll definitely be baking in my oven again! I just cut the sweet potato into smaller cubes (I also leave the skin on as I use organic ones), place them on a baking sheet covered with parchment paper and bake at 200 C (390 F) until tender (about 20 minutes). I bake them plain, i.e. I don’t add any seasonings or oil.